Members of the cast of the Touchstone Theatre production of Happy Place. Photo by Tim Matheson. 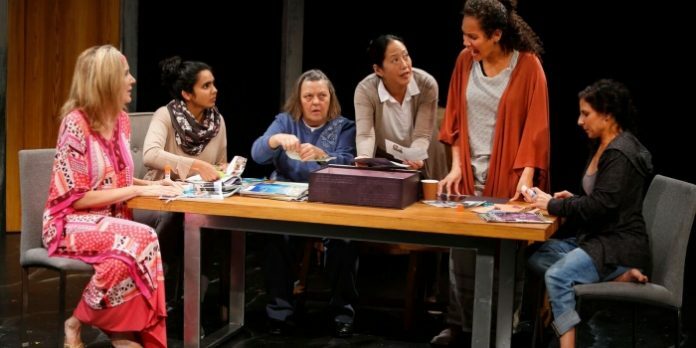 In an intricately woven story unfurling one petal at a time, Happy Place distills the many facets of depression and pain from the viewpoints of six fascinating characters. Written by Pamela Mala Sinha and directed by Roy Surette, Happy Place is a character driven drama that forgoes plot in service to an emotional exploration of trauma and the communities that drive us to heal. When our lead, Samira (Adele Noronha), arrives at the hospital she feels that she doesn’t belong. But the tragedies that tear her and the rest of the women at the hospital away from their outside lives bring them together inside the walls of this “happy place”. Violence, sexual assault, blended family dynamics, and the sheer weight of self-hatred weigh upon them but they all find their own version of a way out through their relationships with each other. Featuring some of Vancouver’s finest actors, Happy Place is riveting from start to finish. Each moment is a carefully drawn portrait of juxtaposed pain. Diane Brown’s Joyce is a middle-aged divorcee favouring a fluffy pink robe and hot pink scrunchy who is depressed despite never being the victim, while Nicola Cavendish’s Mildred alternates between raunch and resistance. Adele Noronha’s sweetly innocent Samira is seemingly out of step with the self-possession and strength of Colleen Wheeler’s Rosemary. The grace of Sereana Malani’s Celine is in perfect dissonance with Laara Sadiq’s quick footed Nina. Sinha masterfully layers the frayed edges of these people until they begin to snap and blur creating a chaos of duality – pain and healing which is underscored by the frayed emotional state of Donna Yamamoto’s doctor, Louise. Pam Johnson’s set is a world of neutrals with Adrian Muir’s minimal lighting ensuring we are not distracted from the emotional core of the play. Dorothy Dittrich’s sound design creates just the right amount of continuity during transitions to transform them into welcome moments of reflection, while Johnson’s set design creates an openness in a world that would otherwise feel stark. Happy Place is filled with dark subject matter treated with grace. Go for the performances. Stay and talk to the people you brought with you to see the effects. It is a play with resonance. Highly recommended. Happy Place by Pamela Mala Sinha. Directed by Roy Surette. A Touchstone Theatre production, co-presented by Ruby Slippers Theatre and Diwali in BC. On stage at the Firehall Arts Centre (280 East Cordova St, Vancouver) until October 29. Visit http://firehallartscentre.ca for tickets and more information.